Simpsons Monorail References To Infinity? I’m curious on your perspective. 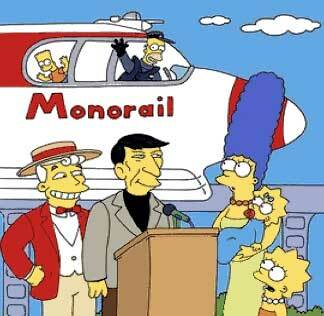 How long will it be before we stop reading Simpsons/Lyle Lanley references every time there’s a story on monorail? Seriously friends, this has been going on now since The Simpsons ‘Marge vs. The Monorail’ episode first aired in 1993. No matter how legitimate the monorail is, that cartoon almost always gets mentioned. Decades later, there’s got to be a new story angle, no? Gawd, how I wish writer/comedian Conan O'Brien had instead written about the true huckster-sold rail technology of our time; 'light' rail. Talk about cartoon possibilities; light rail (AKA trolleys or trams) could be a hilarious story. “Let’s build a big heavy train, strong enough to withstand anything we can crash into it. To help sell it we’ll call it light, even though it’s heavier than a subway train car. Then we’ll put that train in the streets, that’ll keep our construction industry buddies busy for years. They’ll have to rip up the roadways, move utilities, strengthen the terrain and then lay down lots and lots of concrete and steel. String wires all over the sky and we're ready to go. Once it’s finally open, trains will mix with pedestrian and auto traffic. That means it’s a jobs program! Drivers are necessary for every train (complete with their associated strike-happy unions). Let’s sell it as rapid transit, even though it’s actually pretty darned slow. If there’s an accident, we’ll blame the victim for getting in the way. We can spend more taxpayer money on ‘safety outreach’ programs. The programs won’t work, but it makes us look good. Our friends in the industry will smile all the way to the bank with every accident, because of associated train and system repair costs. And our legal friends will keep busy with lawsuits galore." Anyway, maybe I'm not asking. Maybe I'm just venting. In any event, we’ll continue to report monorail news without Simpsons references. We monorailists are a tad beyond cartoon silliness, aren’t we? Monorail Society Editorials do not necessarily reflect the views of all TMS members.